Have you ever been to a tradeshow? What captivates you the most during your visit? Well, it should be none other than a very eye catching POS Display. A POS display also stands for a Point-of-Sale Display. If your company is participating in a trade show, your main concern would definitely be on how to attract visitors. And as you are all aware,a trade show is a very competitive battle field. The pit fall of a trade show will have to be the strong competition among companies that offer the same products. So it is vital to utilize a POS display to make your company standout from the crowd. Recently, ODM has made a trip to the HOFEX Food & Hospitality fair at the Hong Kong Convention & Exhibition Centre. During our visit, ODM has managed to spot a few interesting POS Display. Read on to find out more about the benefits of these POS Displays! During our visit, there were many beverage companies with outstanding POS Displays. And among these eye catching displays, there is one company that stood uniquely among them. Mas Pares is a food manufacturing company that mainly focuses on top quality duck and goose products. 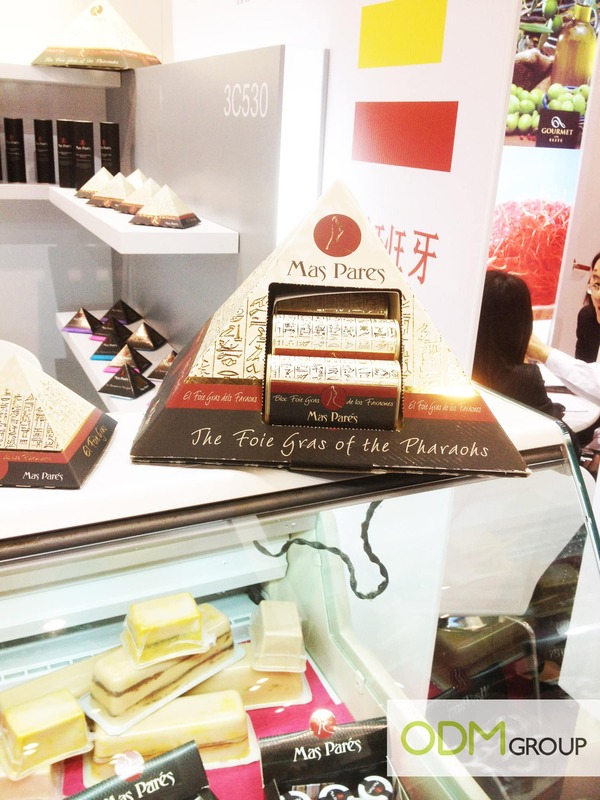 This company has cleverly used an eye-catching pyramid POS display to showcase their foie gras products. It has a brilliant shape that is easy to spot and provoke curiosity. Besides that, its shiny exterior makes it even harder for anyone to miss it. This simple yet classy display has an imprinted logo and brand name on it. And this definitely encourages brand awareness and brand recognition. Hence, it is proven that with a little creativity, companies can certainly come up with an attractive POS display!